The Lovell FHCC Walk-In Center for Homeless Veterans is offered for Veterans that are homeless or at risk of becoming homeless to learn about housing options offered through the Grant and Per Diem Program, HUD/VASH, Homeless Veterans Rehabilitation Program (HVRP), as well as community resources. Homeless Programs at FHCC Lovell are an integral part of health care, as we strive to eradicate homelessness among Veterans. 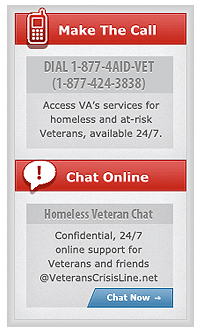 We assist Veterans with homeless prevention services as well as with emergency, transitional, and permanent housing options. We also assist Veterans with establishing comprehensive care plans (medical, mental health, substance abuse treatment) within the FHCC Lovell Health Care Center.